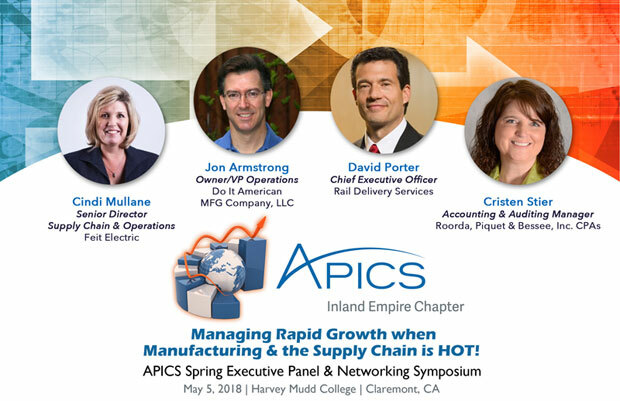 CLAREMONT, CA – April 6, 2018 APICS Inland Empire Chapter (APICS-IE), the leading association for supply chain and operations professionals, is proud to announce the Spring 2018 Executive Panel and Networking Symposium focusing on: “Managing Rapid Growth When Manufacturing & the Supply Chain Are Hot”. The event will be held on Saturday, May 5, 2018 at Harvey Mudd College in Claremont, California. This event marks the seventh year that APICS-IE convenes a Spring conference and expert panel to share insights on global supply chain trends and strategies. In addition to insightful take-aways, engaging dialog and collegial networking, APICS-IE serves as a resource for supply chain professionals seeking certifications and industry connections. “Manufacturing is on an upswing and the pressure is on to attend to unparalleled customer expectations while maximizing profits. Many manufacturers are seeing this as a huge opportunity to be industry leaders” commented Lisa Anderson, APICS-IE Chapter Leader and President of LMA Consulting Group. The panel discussion allows for insights and key learnings to be shared by executives and experts in manufacturing and supply chain. “Every time we meet as supply chain professionals to share experiences and best practices, it makes us stronger and more valuable contributors to the growth of our businesses” she concluded. The symposium attracts industry professionals from throughout the Inland Empire and Southern California and welcomes students. The Spring Symposium is being hosted by Harvey Mudd College as part of the strong partnership with APICS-IE. “APICS Inland Empire Chapter has been a valuable partner to us. Our students have been able to meet with and learn from manufacturing and supply chain professionals. They have worked on projects solving real business challenges and have competed in student case study competitions. These are great experiences in preparing for the business world” commented Kash Gokli, Professor of Manufacturing Practice and the Engineering Clinic at Harvey Mudd College. The students at Harvey Mudd College recently won the APICS regional student case competition and an award for Innovation by the Manufacturing Council of the Inland Empire at the recent Manufacturers’ Summit. APICS is the leading association for supply chain and operations professionals and the premier provider of research, education and certification programs that elevate end-to-end supply chain excellence, innovation and resilience. APICS Certified in Production and Inventory Management (CPIM) and APICS Certified Supply Chain Professional (CSCP) and the recently introduced APICS Certified in Logistics, Transportation and Distribution (CLTD) designations set the industry standard. The organization includes 37,000+ members and 250+ international partners.